I don't think I've ever been identified as a cinephile. Sure, if I like a film I will talk about it, and possibly analyze it, but it's not a deep passion, not the way books and certain TV shows are for me. Still, as a child, going to the movies was one of life's greatest pleasures. We had a theater just two blocks away, so it wasn't a hassle to get there, and when I was a little older and IMAX type, stadium seating developed, it meant a fun trip to the city or maybe Forest Hills, each of which was a little different, and really it didn't take much to get excited about even the most mediocre movie. Shorter wait: When Titanic came out at the end of 1997 I saw it four times in the theater. I never do that anymore. It played in the theater for months, and then it came out on VHS in September of 1998. I remember this specifically because I held on the receipt for sentimental reasons: I purchased the video in the Borders located in the World Trade Center. I'll never let go of that receipt! The point is that if I didn't see the movie in the theaters, I would have had to wait 9 months to see it, and if I hadn't bought it, I would have probably have had to wait til I could get it at Blockbuster, which could take forever. The only film I saw last year in the theater was Bohemian Rhapsody. It was available digitally less than three months after its theater release date. Hence, I normally just wait. Stream Away: I subscribe to a number of services that offer enough movies, new and old, to satisfy my viewing needs. It's too much, and I know I spend enough time watching stuff, but it's still a better value. Crowds!!! I admit that sometimes, watching a superhero movie with an audience, and hearing their reaction along with my own, can be fun. Overall, though, I don't care for sitting in crowds, and prefer to sit on an aisle, which is normally not the best angle, and not guaranteed in a popular movie. 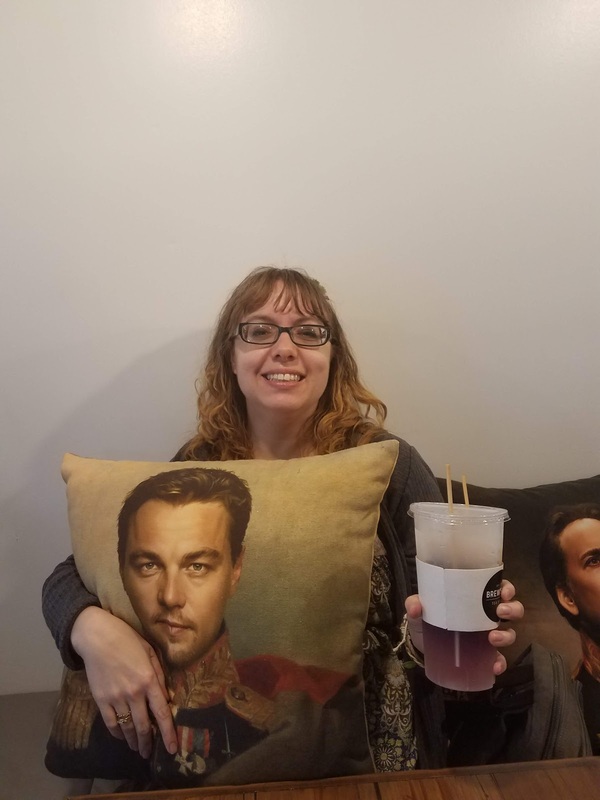 When I saw Bohemian Rhapsody I picked a theater that had reserved seating, which is a good idea, until you find that someone is sitting in your seat. Somehow I had the courage (foolhardiness?) to ask the guy to move, but even that action took away some of the enjoyment. Then there's the other noises that are unwelcome - like conversation, chewing, babies crying, that as I get older bring out the crabby in me to a higher degree. It's a shame. Leaving the house: This can work for and against going to the movies. On a rainy day off, it's nice to make a pillow fort and catch up on some Netflix, rather than sitting a soggy self on a carpeted chair, placing umbrella on a sticky floor. BUT it can also be fun to use the movies as an excuse to get out of the house. This depends on one's current mood. Ah! But what about the 'surround sound', the huge screens, the special effects and 3D? Yes, it's cool, but I also think these can be overwhelming. Again, that's me. I have sensory issues. I'm still not sure if the migraine I got the day after seeing Avatar in 3D came from the movie or the cheap champagne I tried later on. I don't care for 3D because it costs extra, and I don't like putting glasses on top of my glasses. No, I don't want to put on contact lenses so I can look cute in the dark! To bring this around to my central theme of tea - it's terribly awkward to take tea in a theater. There's also the matter of not being able to pause for the inevitable bathroom break. We need intermissions, like they have in Bollywood films. I'm obviously not anti-theater, but I prefer to limit my visits to absolute must-sees (or a free ticket, but sometimes not even then if I'm not in the mood.) I can compare my preferences to going to the beach. I like it, but once or twice a year is more than enough for me. Viewing is better when there's a cat atop oneself. I must have expressed on this blog, at least once, my disdain for Times Square. I didn't mind it so much when I was younger, but it gets all the more irritating to pass as I live on. I cannot control myself from saying "Nope,", and "I don't want to be here", when I find myself passing the area. It's an artificially lit outdoor crowded circus: what's to like? And I mean the clown kind of circus, not the Piccadilly kind, though I've gone off Piccadilly Circus nowadays as well. IF I'm seeing a Broadway show, I must go there as a necessary evil, but even then I'd rather not linger outdoors. There are a few side streets off Times Square that I can tolerate, because side streets in general are usually by nature quieter, even with theatergoer spillage. 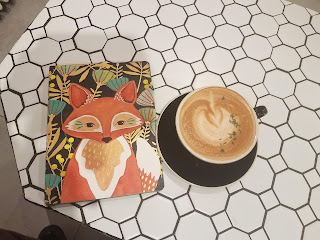 So, to find a cafe right in "Hell's Kitchen" that is not (yet) a chain, and had welcoming space to sit and relax and have my cheat coffee, was a life bonus. 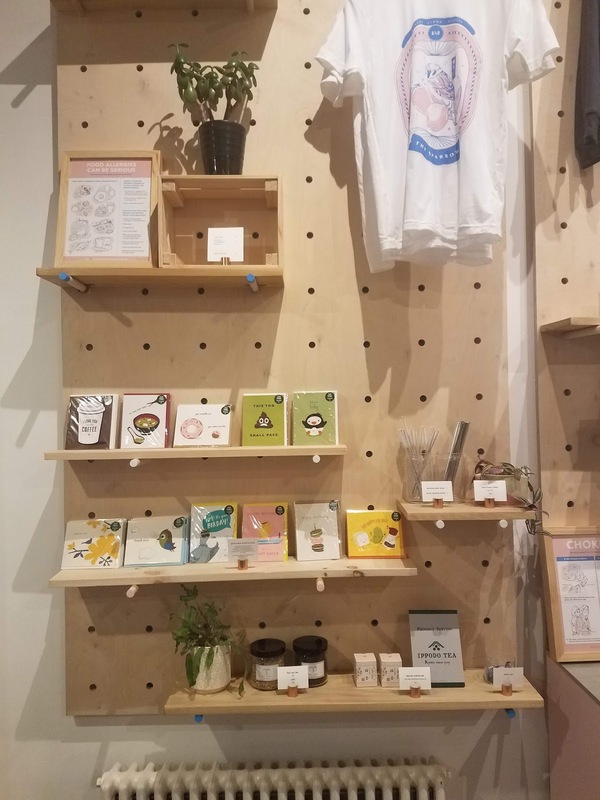 Welcome to Bird & Branch! 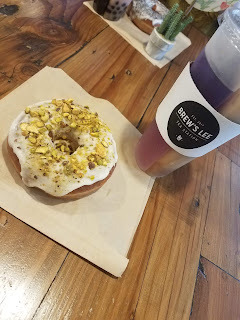 I think I've mentioned my cheat coffee days before. Though I love tea, sometimes I crave coffee, but it rarely agrees with me. 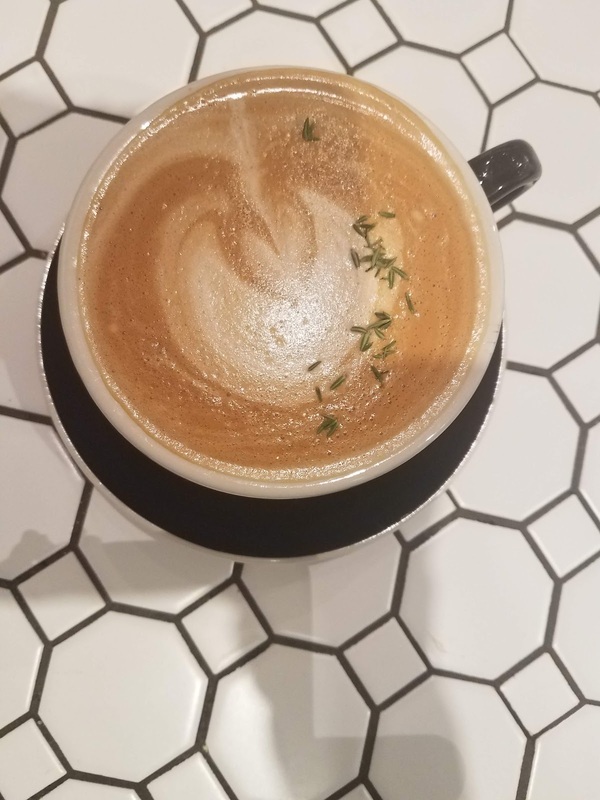 I try to have a latte of some sort once a month, so the craving is settled, but my health isn't destroyed. On this occasion, I was suffering from the remains of another cold - the gross kind where dairy is out of the question. So I chose a Blackbird, a signature drink of theirs that contains macadamia milk and blackberry syrup. It was gorgeous, though I will say you have to be in the mood for that blackberry flavor. Just me, a fox. and a bird living in harmony. When I arrived, there were a few people on one side of the shop, and an empty table that could sit four people comfortably. As always, I prefer to sit in a less populated spot, and with my need to blow my nose grossly, I thought a slight quarantine would be best. I felt as if I were far removed from the busiest part of Midtown. Got some writing done, felt like I was on a mini-vacation...until a man and his daughter? came and sat down at my table without asking. Why do people do this? There was at least one other table open, but they had to just plop down during non-rush hour and spoil my peace. Without asking. Do I expect too much? Possibly, but it just took me out of my happy mood. I just don't get why people can't even ask. It's making my efforts to find nice cafes in New York nearly impossible. How do they know I'm not contagious? (I might have been, the cold was a few days old at that point.) Also, what if I'm meeting someone? I just don't understand the lack of courtesy. I never will. If you're not a complete neurotic like me, or even if you are, do visit Bird & Branch if you're in the area. The name itself makes it worth it, as does its menu. Love planty plants in my cafes. Pretty and pristine at once. As y'all now by now, my sister Bonnie lives in Texas. 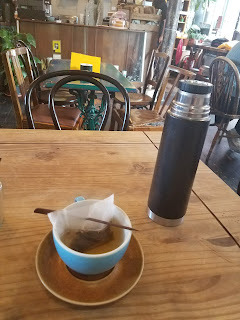 Surprisingly (to me, anyway) there are many, many coffee destinations, which also tends to translate to tea destinations. 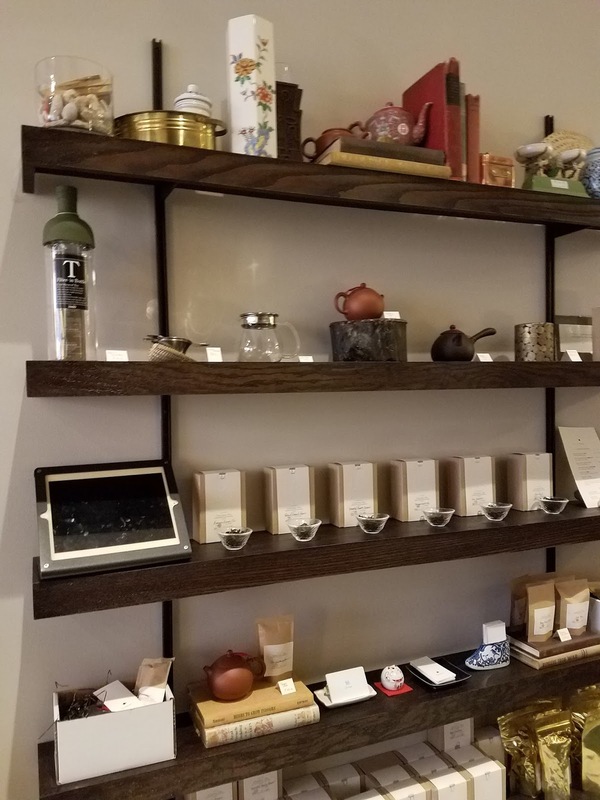 That's because these places likely carry decent brands of tea, so although they may focus on the coffee, you can be like me and get a nice herbal blend, or even a decent Breakfast blend, and a pastry, and curl up with a book to pass the time. My sister knows how much I love this, and even more so, she knows how much I love places that aren't overwhelming. So when she texted me about a new spot she visited, she said "they have a good tea selection too and some real cozy nooks", I nearly booked a ticket right then and there. I'm not really in the mood for travel at the moment, though. I've had some changes at work recently, which I haven't come to terms with mentally. Did I mention I don't like change? The cats at home are still not best friends, so I don't want anyone else to have to deal with them yet. My finances are pretty sad, and though a No-Spend month/year has proven difficult to carry out, I've cut down on quite a lot of unnecessary shopping. Food and cat items are enough to knock my budget senseless! 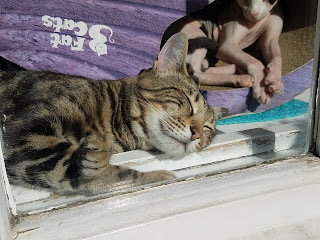 Even so, I'm desperate for warm, cozy, snug, relaxed moments, and though I get a few of these at home when the kitties are both napping, I find a decided lack outdoors. I get that I live in one of the busiest cities in the world. It doesn't make for easy locating of snug hole-in-the-wall cafes. I keep looking. Note I said snug, not smug. That I can find in spades. Madame Sou Sou is not a bad choice. It's a little pastry cafe two blocks from the Astoria Bookshop, but each time I've stopped by, despite it nearly always being the weekend, I manage to find a nice table in the corner. Even when there are plenty of people there, it doesn't feel oppressive. And so far I've liked everything I ordered from there. 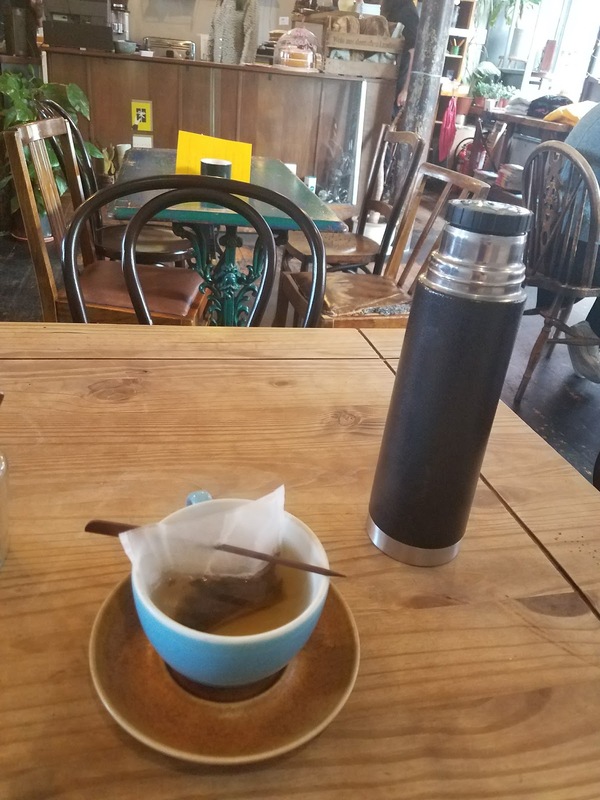 I'm afraid to devote a whole post on this cafe, because if it catches on too much it'll become...the dreaded word...packed. Some people love a bustling cafe. Lots of chatter, people to and fro, and caffeine! For me, this is the recipe for a panic attack. I hate loud voices, chewing noises, and blaring music. I firmly dislike being brushed against as I'm trying to read or write. It's bad enough I have to deal with this on my commute. The problem is that this is almost inescapable in New York. If you've found a quiet table, someone will want to share the table with you. If you're reading, the guy at the next table will want to talk about what you're reading. Though I can't say I've never initiated a conversation out of doors, it's often not what I'm after when I'm on my own. 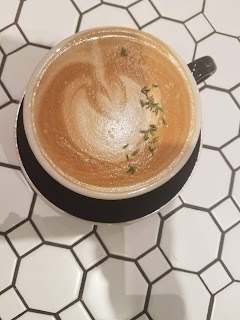 This is not something affecting my daily quality of life, but it would be just fantastic if I could map out more tea/coffee spots that are friendly to my senses. Bonnie has done this for me in San Antonio - everything is bigger in Texas, but in spacing things out you end up finding privacy - but the struggle continues in New York. It's not always easy in London, either, and I wouldn't mind having ample opportunity to find some real cozy nooks there! Alas, the budget. The big advantage of San Antonio is bigness. 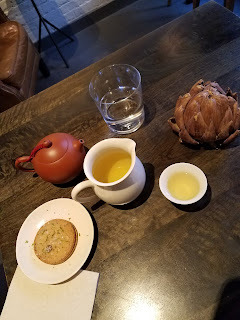 This might be a break-up; it's definitely a "break"
I recently posted here about an issue I took with my favorite restaurant, Tea and Sympathy Yes, it was a complaint, but I was sure I'd return, and of course I did since that post. When you love something, it takes more than a little disappointment over a menu change to keep you from returning. Now, though, I'm at the point of no return, or at least a point of doubtful return. And it's a difficult feeling, especially at a time of so many other changes in my life (more on that another time, maybe). 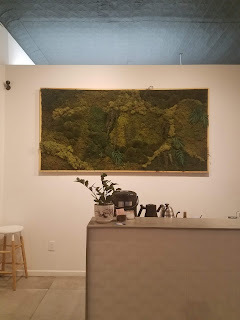 Many years ago I had a terrible experience at another favorite tea shop, Teany. Even so, I gave them one more chance to redeem themselves, and they sort of did, but not enough for me to really want to keep going back. They are gone now, and it's for the best. I don't want Tea and Sympathy to go, but last week I had an experience that made me agree with their bad reviews, and I suspect my money can be spent better elsewhere. I've had complaints before. 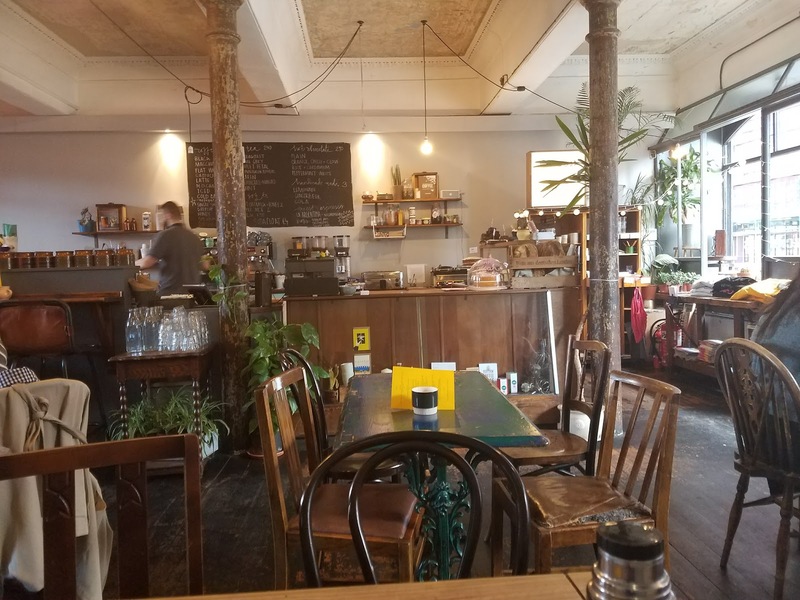 I don't like eating in crowded spaces, and because it's a small and popular place, you'll inevitably dodge elbows and nearby conversations whether you like it or not. Somehow I put up with the human proximity. I noticed sometimes the servers were not terribly nice (while some are, to be fair). I excused this, thinking it contributes to the English atmosphere, and continued to tip like an American while ignoring the irony. I put up with the price being a little higher for credit card users, because technology and such. Oh, and I observed The Rules. This is a little list posted on the outside of the shop and on the menus. It's a little kooky, but these things are usually derived from experience in running a business. One rule is that you can't be seated until your whole party arrives. Another urges pleasantness to the waitresses, and another advises you that you may be moved from your table. The rest is about tipping and minimums, and I get that. So all these years I always arrived with my full party, I was nice to the waitresses (when am I not, though? ), and if I had to move, I'd do so, even with a mouth full of scone. I loved the place that much that these things weren't exactly putting me off. I felt differently last week. My friend Cathy and I went a couple of Sundays ago for a last visit before her upcoming move to the West Coast. 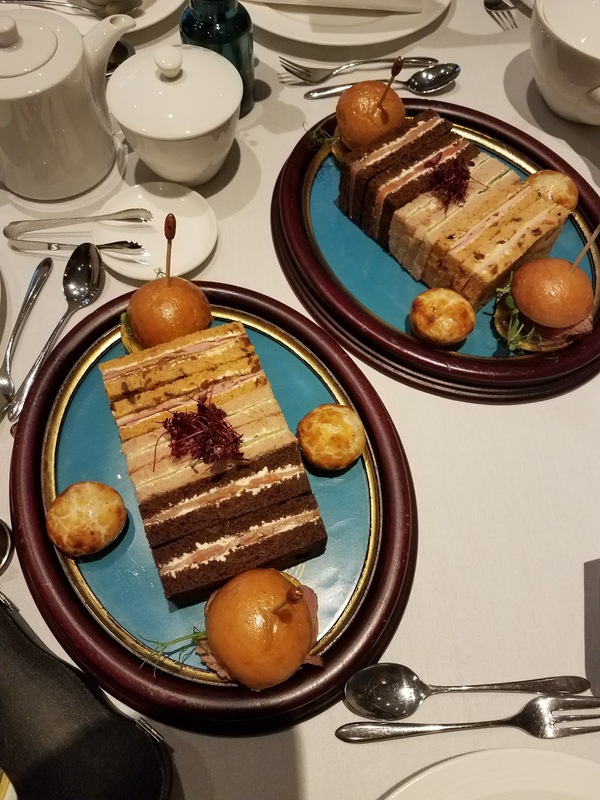 It turned out we were seated too early for the menu items we wanted, so we got Afternoon Tea, which we loved, and planned to come back after work on a Wednesday night. Maybe that's indulgent, but both of us loved Tea and Sympathy so much, and would miss going there together. Cathy's been going for over a decade, and I've been since 1995. If someone asked me what was my favorite restaurant, it was always the same answer, and as I've said, I have brought everyone I possibly could there to share in my joys. If they complained about something in the service or food, or the price, I made every excuse, because, again, this was My Favorite. Perhaps it was a misplaced loyalty. On the Wednesday evening in question, we got to the restaurant about a quarter to six. Usually at this time we found a relatively empty room, but this time it was packed. So I told the waitress we were looking for a table for two, and waited outside. It was a longish wait, but we felt it was worthwhile as long as we had a decent table. And we did - the table for two by the table that we particularly love, so never mind the slightly numbed fingers and toes (you have to wait outside for your table). We almost missed it, as the waitress looked as if she was going to take a couple of girls who had arrived well after us first, but we spoke up. We were in for a good evening. The menu had a seasonal item I'd been waiting for all year, and we discussed the possibility of a glass of red wine. And we waited. And waited. The wait seemed unusual, but there was only one waitress on that night, and a full house, so why complain? It'd be all right in the long run. After about twenty minutes, the waitress approached us. Would she take our order? Nope. She informed us that we were going to have to move to the center table, as they needed our space for a party of nine who had made reservations. First of all, that center table is not pleasant. It's near the door, which means draft, and it was a cold day out. I'd dealt with a similar table in Caffe Reggio a few days earlier, and it doesn't make for a happy dining. It also means that anyone entering the premises stands right on top of you, and anyone moving around will bump into you. But this might have been acceptable if we hadn't already been kept waiting twenty minutes at the table by the window, without even a glass of water to pass the time. Also, the two girls who'd came in after us had just been seated by the other table by the window. Their order hadn't been taken yet, so they could easily be moved to the table of doom. Before we could bring that to the waitress' attention, she proceeds to go over to their table and take their order. Again, we'd still not had our order taken. We decided enough was enough, and left, though Cathy did communicate her unhappiness to the waitress, who didn't try to make amends at all. This left us with empty stomach and a bad taste in our mouths. Cathy will likely never, ever go back even if she's in town, and I'm not sure about myself. We wondered, and hoped we were wrong, if our less than stellar treatment was due to a racial bias (the girls who came after us were both white and one of us is not). It's not something we want to believe, though I've heard others make that claim in the past. I always said it was in their heads, but who knows? And why would they take reservations for a party of nine? Seriously? 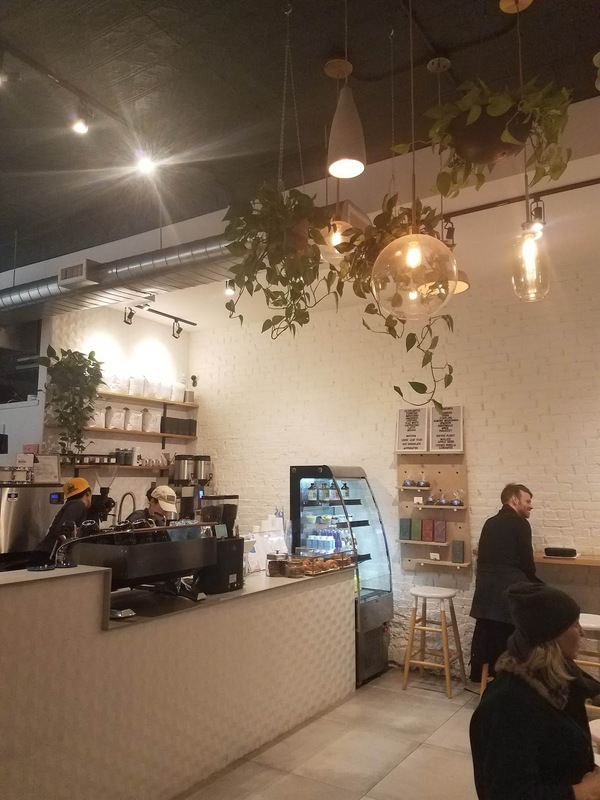 A few months ago, Tea and Sympathy started a Go Fund Me account, because despite being busy, they had trouble paying rents. I understand the difficulty - so many businesses in the City, and particularly the Village, have gone under not because of a lack of customers, but because rents are astronomical. I feared its demise, but now I'm feeling tepid about the whole situation. 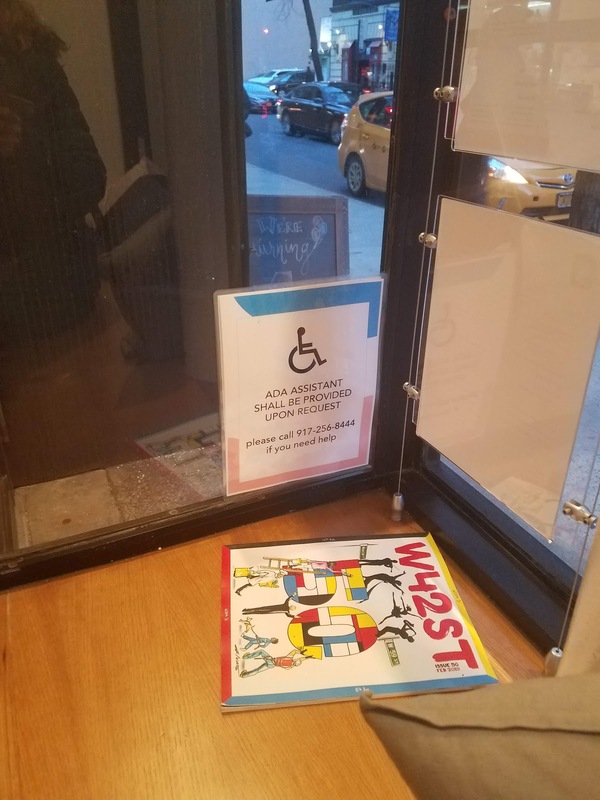 Why should I feel for a place that doesn't act like it wants our business? There's a big to-do about celebrity patronage, but we tiny unknown Britophiles are obviously expendable. I don't want Tea and Sympathy to close down, but I don't want to return to a place that is terribly lacking in its service. Frankly, I can't afford it. So, for now, we're on a break. I'll have to find another cozy spot to bring my friends. Suggestions are welcome. When I envision an ideal living situation, it's usually in a cute cottage surrounded by a manageable garden and some wildflower space. The cottage has a baking-friendly kitchen, is stuffed with books and cozy reading nooks (at least one window seat), and there's at least three cats in residence. I have the books in my railroad apartment in Astoria, plants that tend to die, and have had up to three cats at once in the past. I also have mild allergies and a budget. So I've been down to Zenobia for five years now. It wasn't a bad arrangement. Zenobia is friendly (to me), and playful for her age. I'm sure she would be fine with keeping it just the two of us. But lately I was drawn to the idea of having another kitty, preferably a boy, but not a kitten. I'd also never had the chance to adopt a cat from a shelter. So I took to the internet, and found a local spot that didn't make you give blood in order to adopt. There are always adoptable dogs and cats in shelters, but a match is not always easy to find. For instance, on my first visit there were some bonded pairs, which basically means you have to adopt them together. I think that's wonderful, but I'm not up to having three cats at the moment. It was okay with Bubuck and Moofer back in the day, but that's because Zenobia was young and she'd already met them both. I didn't want to overwhelm her (or my above-mentioned allergies and budget). I didn't find my match on my first visit, but I didn't give up. On my second try, upon entering the cat room, the first kitty I spotted was not in one of the cages, but a little room near the kitten area. 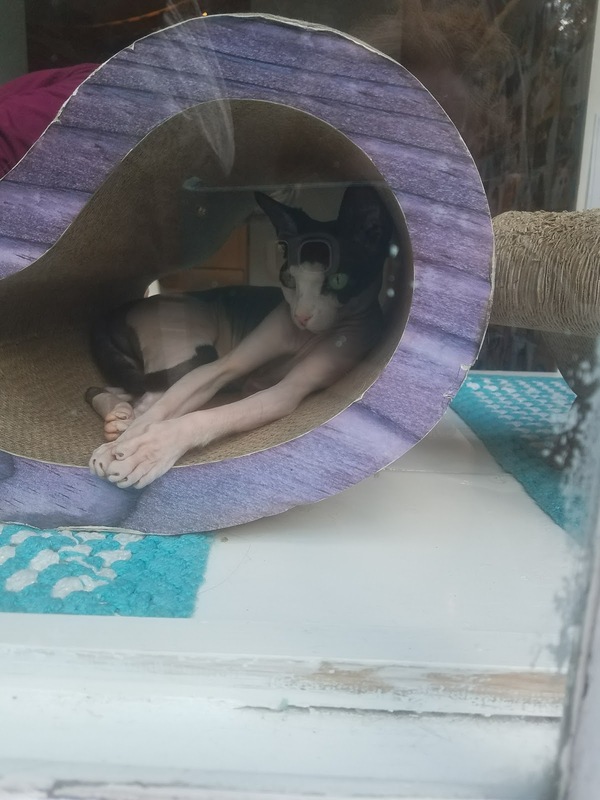 As soon as I saw the big ginger lounging behind the glass, I asked about him. The volunteer said 'that's Frederico', and I had to know more. So she took me inside. 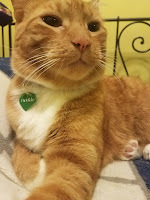 'Frederico' shared the room with two other kitties names Sylvester and Tweety. Neither of them seemed interested in me, but Frederico approached straightaway. And sparks flew. No, literally. It was cold out, and I gave the poor guy a little shock as he went to sniff my finger. But he was obviously social, and I fell in love. The volunteer read his history: he was an owner surrender, which was all I knew about his previous life. That and he had ingested dental floss a few years ago and had to have it surgically removed. And he was seven years old. That was a little older than I'd expected, but I figured he'd be much calmer than a kitten, and Zenobia would appreciate that. 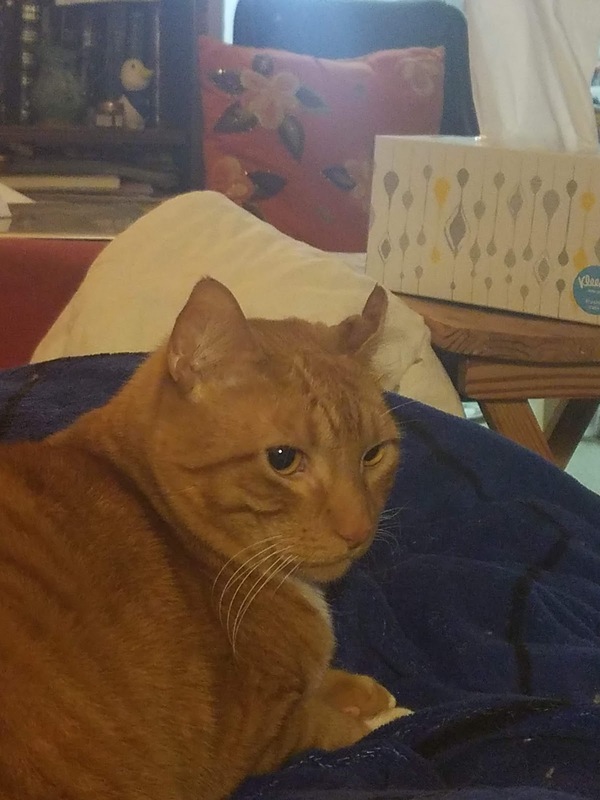 He also had a slightly scrunched left ear, but there weren't any health issues related to that. I wanted to hear his voice, but all he managed were the little rrrrp and mrrr sound effects, which probably sealed the deal. 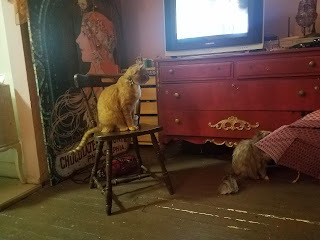 Any cat who simultaneously reminded me of Cinnamon and Moofer was okay by me. I'd hoped to get him into the front rooms without any fuss, and keep the two cats separated for a few days, but before I could take my coat off, Zenobia was at the carrying case sniffing, then hissing, then wheezing dramatically. I spirited him off to the front rooms, shut the doors, and let him sniff around. 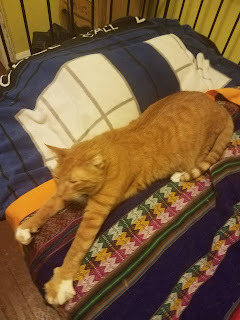 The first day and night I had a quiet boy who hid under the bed and had a normal appetite, and was cuddly when I came to visit him. I still spent as much time as possible with Zenobia, as I wanted her to feel like I hadn't forgotten her in favor of a younger model. I was starting to regret my new name for him: Freddie Purrcury. I thought it would be an easy change from Frederico, and a chance to finally name someone after my favorite singer. With the ear and the ginger fur he could have been Vincent Van Gogh, but that didn't roll off my tongue. By the second day Freddie had found his voice. And he used it! He was no longer satisfied with two rooms (bigger than quite a few New York apartments, but after all, his namesake had lived in a mansion in Kensington. 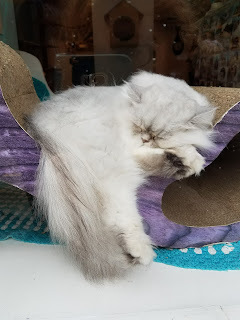 Now, I like the sound of little kitty mews, and the occasional howl, but I also suffer from a mild but nagging case of misophonia, and persistent yowling and door scratching was interrupting my beauty sleep. So I did what has always worked when faced (or eared?) with a snoring roommate: kept the TV on full blast. It's loud, but it's my choice, and I was able to rest somewhat. 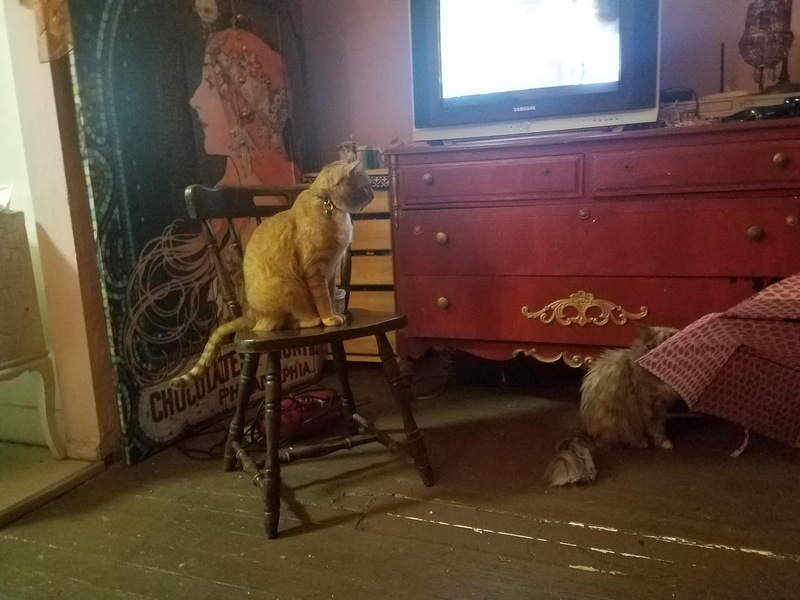 After a couple of days, I brought the kitties together. Zenobia's first response was a repeat performance of wheeze-fest. Then the hissing commenced. This was not a love match. In fact, it was a crisis. She stopped eating for a couple of days, lost weight, and found herself back at the vet. 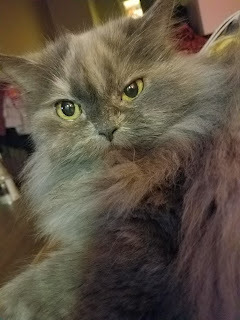 She will be okay (for now), but I reminded her she was a century too late to protest for women's votes, and got her all her favorite canned food. And I let her tell me where she wants to eat. Yes, she's spoiled, but she's earned it - and at last she has the evil sound effects to complement her resting death glare. As soon as Freddie had a chance to explore the whole apartment, I learned that he truly is a combination of many of the boy cats I've known: he has the high jump of Cinnamon (and the sudden poofy tail), the little grunts and love bites of Moofer, the ability to find and tear through any package of cat food, cat nip, or treats that is not put away under lock and key, like Moofer and Bubuck, and the weird face licking of Chubby (my fur "nephew" of old). Maybe girl cats do these thing too, but not the ones I've known. Zenobia scratches furniture (and Freddie scratches the furniture Zenobia doesn't bother with, like my swivel chairs), but she's never been terribly curious about every space in existence. She's not even a window cat. 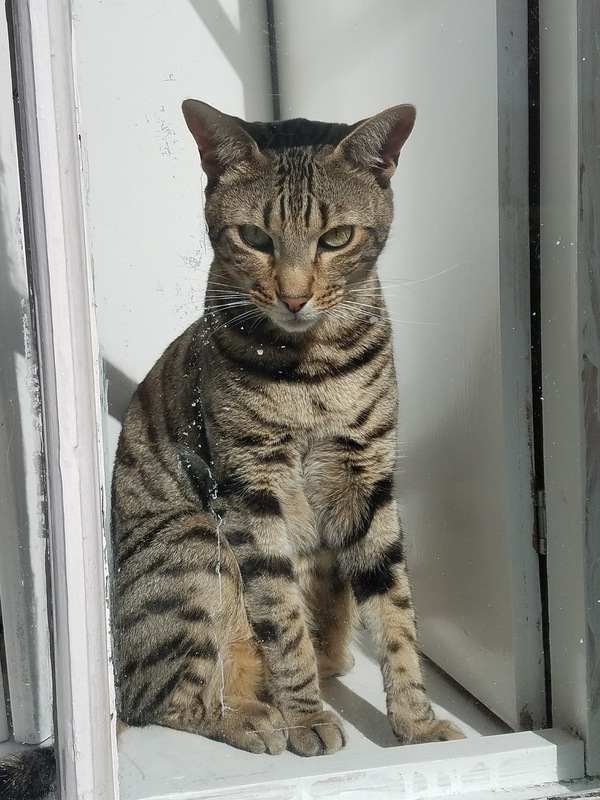 Freddie is, which I wouldn't mind, except he nearly ended the household by turning one of the stove knobs on his way to a kitchen window. It's a good thing I have a sensitive nose! So I'm on my toes. Freddie has been part of the family for nearly a month now. Aside from learning to deal with his active nature and morning caterwauling, and Zenobia's demonic noises (they get more and more creative), I've loved having another kitty at home. Now I just need the cottage. 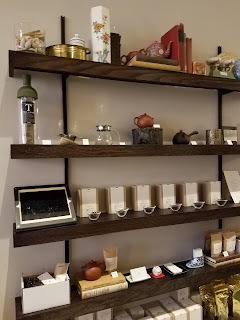 I'm still amazed at how I can squeeze new tea experiences out of every visit to San Antonio. It's not a Tea Destination, at least not at first glance. 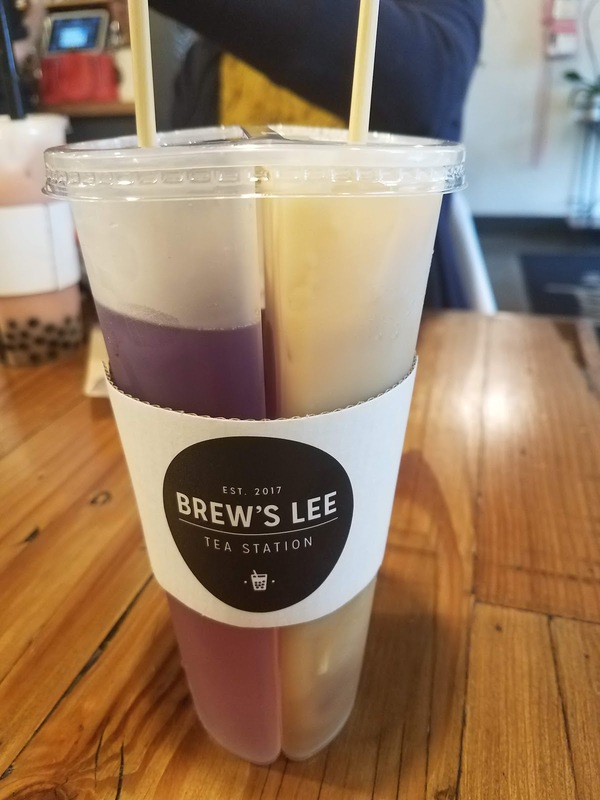 I remember when Bonnie first moved to Texas, one of her personal challenges was finding decent bubble tea (or Boba, your choice). Even quirky Austin was disappointing on that score. Things have changed in five years! Enter Brew's Lee. Well, entered over a year ago now - but last November it had just opened so I couldn't make it. It's a fun, 'Instagrammable' shop with celebrity pillows and selfie opportunities throughout, and ample seating which always helps. Thankfully, that's not all it is. Atmosphere is important, but quality is vital. The families of the owners grow tea in Taiwan, so there's some serious Oolong going on here. The drinks are usually sweetened (at varying levels), which normally takes away somewhat from the genuine Oolong flavor, but in this case, and with iced tea, it just works. Plus, we're talking Texas here. They just love their sweet tea! As I usually don't go to the same place twice during each San Antonio visit, I knew I wasn't going to be able to try all the flavors. I was impressed by the Split Cup. You get two flavors - the best of both worlds! So I had an Oolong Milk Tea, and a Glowing Tea (herbal concoction). 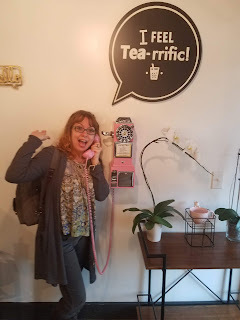 I was still kinda hyped up on caffeine, but only to the point that I was Chatty Cathy. 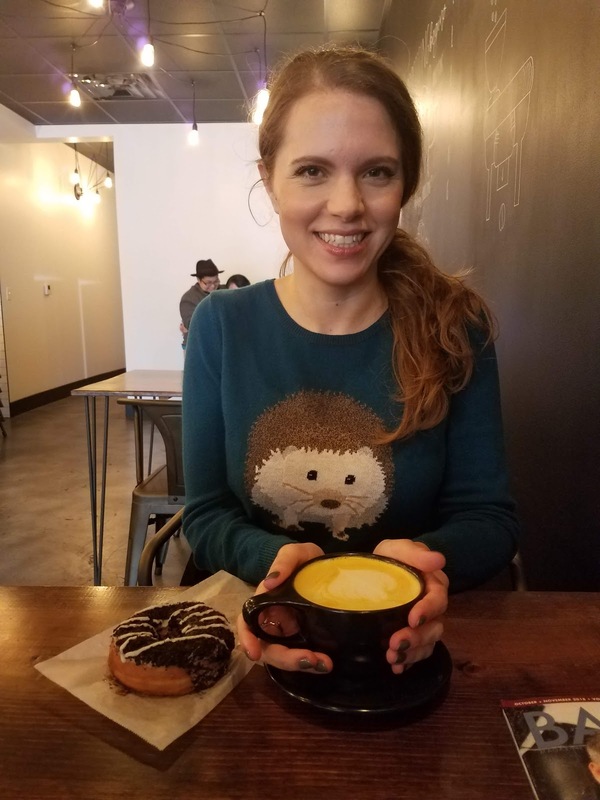 There are snacks (I had a donut), but I probably won't go for food food there, because when I'm in Texas I need to eat as everywhere as possible, within my own diet restrictions (they vary). Please give this place a try if you're nearby! Boba abounds nowadays, but quality to this extent is rare indeed. I am never happy to criticize my favorite restaurant, and when I have mild complaints I keep it to myself. 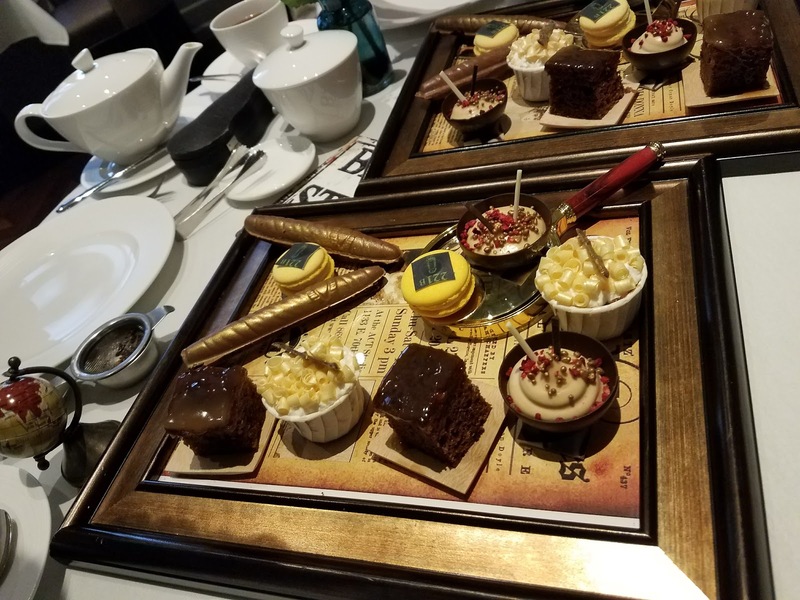 There is something that I want to address, though, and that's a tiny change to the menu of Tea and Sympathy that I just don't understand. My first ever visit to Tea and Sympathy came shortly after coming home from my first trip to the UK in 1994. It would be another four years before I would be able to return. 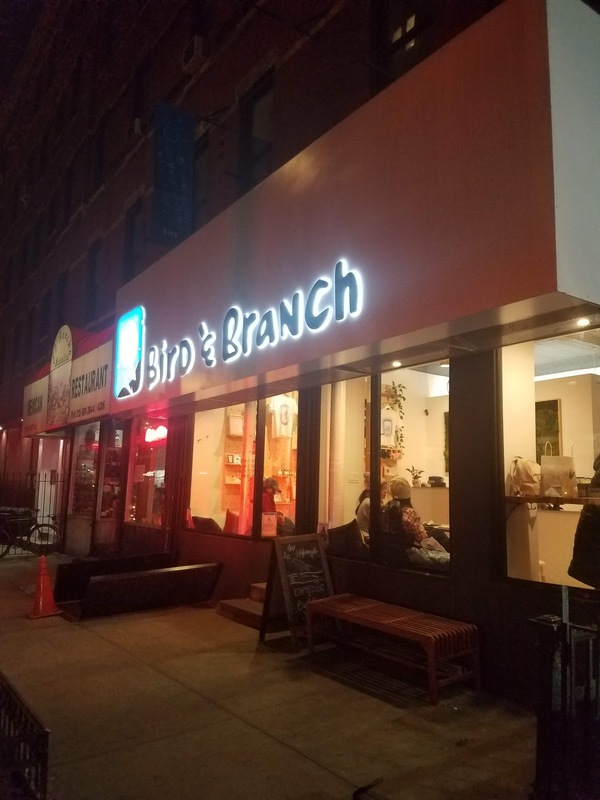 Now, New York is and has always been a pretty diverse city, and it's easy enough to find a restaurant representing nearly every culture on earth. The old-school cozy British tea culture, though? Not so much. Scones were extremely rare in the 1990s here, as was being served tea loose from a teapot. Soon enough I would be able to source loose tea in the Village, and make it myself. Fine. Eventually I'd find British teas and paraphernalia online, but not in the mid-nineties, and ambiance was another thing altogether. 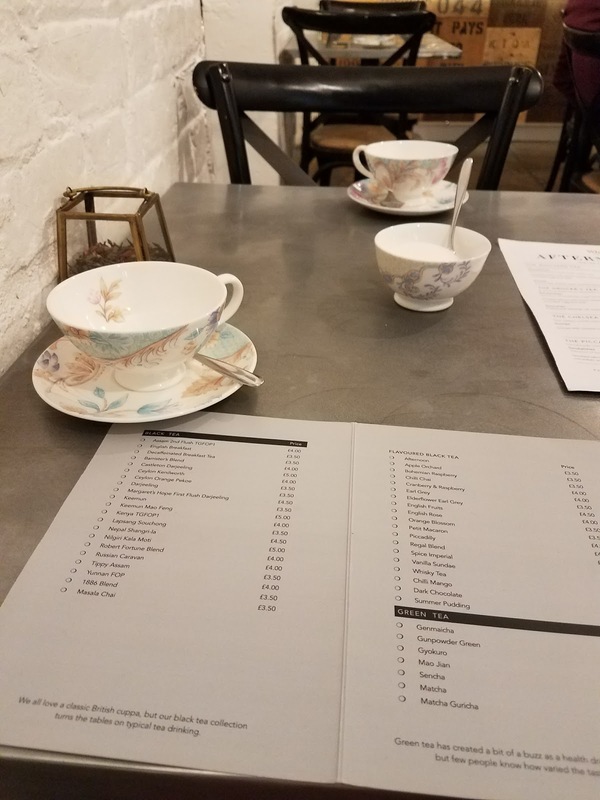 When some friends of mine found out about the still new British restaurant called Tea and Sympathy, it took barely a minute for me to hightail it over there. Now I always whine about being broke, but in my late teens I was truly, truly empty of pocket, and if it weren't for the fact that I lived at home, I'd be in direr straights. So visiting any restaurants that didn't have golden arches was a luxury. Somehow I pulled together enough cash to have my first cream tea at Tea and Sympathy, and I count this as a major contributor to my Tea Love. The decor has barely changed: cozy and slightly shabby-pub/tea shop interior, with crooked framed pictures of royalty and Cockney rhyming slang on the wall. It's a home away from home for British ex-pats and Anglophiles alike. Since the first visit I've dragged nearly everyone I was close to there, including my Dad (despite his dislike for dining out he loved the apple crumble), but I probably wouldn't have returned so quickly if it hadn't been for the relative affordability of the cream tea. 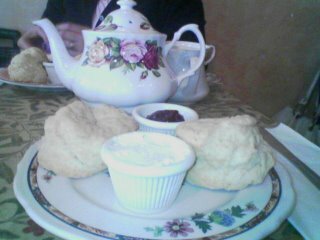 Such a simple pleasure: two scones with clotted cream and jam, and a nice pot of whatever tea floats your current boat. Over the decades, I've been back many, many times, and tried nearly everything on the menu. I rarely come in just for cream tea, but I liked knowing I could. 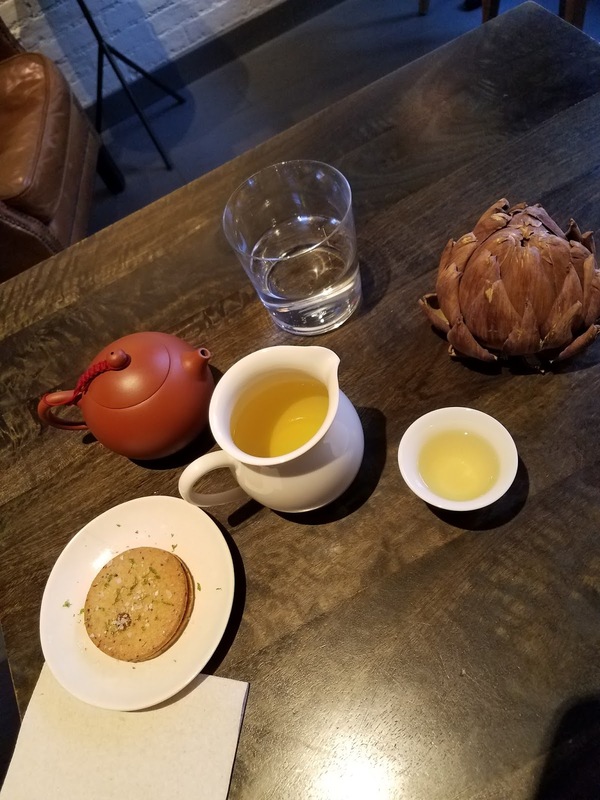 Recently I had my not-favorite kind of doctor's appointment, the offices of which are located close to Tea and Sympathy, so as is my custom, I thought some comfort food would set me up nicely. 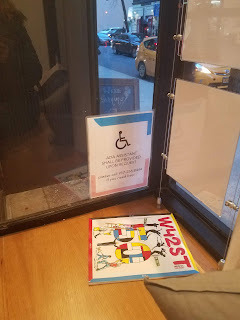 The restaurant was nearly empty, and I got the coveted table in the window. I looked at the menu...and something was missing. 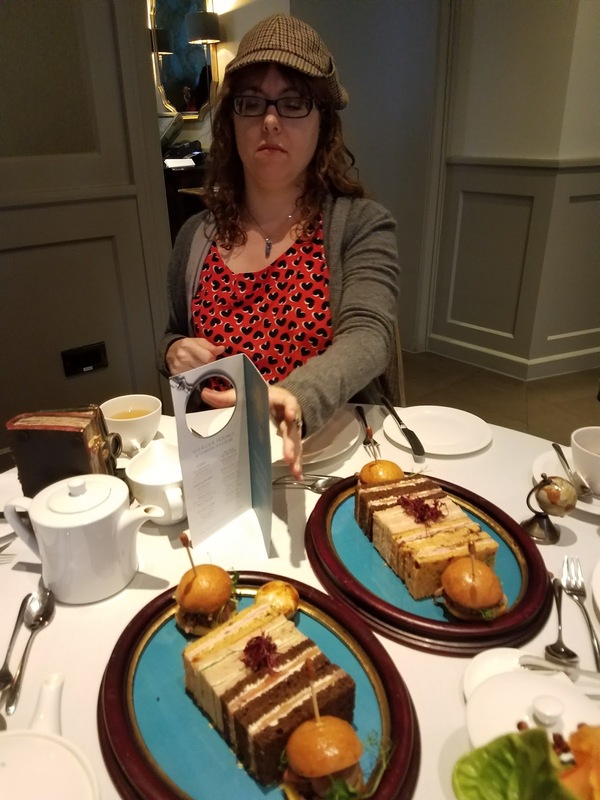 I asked the waitress where's the cream tea, and she explained that it's gone, if someone wants to order scones they can after ordering something else, or they could still have scones with their afternoon tea. I ordered the beef cottage pie, and sat and quietly stewed over this change (after texting my sisters about said change). Why though? Is it because people order such a "small" menu item, and then linger too long in the not-very-spacious restaurant? Was it an accounting decision? Though I respect that a business needs to keep flowing, it makes me sad that a person like 1990s me, or even modern me on a budget will now have to think twice before stopping by. Perhaps none of my me's are the preferred clientele. For argument's sake, I know that in parts of Britain, "Tea" refers to dinner, or supper: the evening meal, as it were. So I suppose the name still fits. 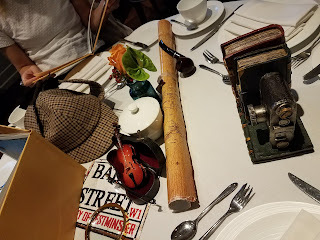 But now we get back to the point that it is a British restaurant. As someone who has managed to visit London and various other parts of the UK over the years, and has a homing signal for the word "tea", it occurs to me that even in the cities, you rarely have to walk long before you find a shop that offers cream tea on their menu. It's ubiquitous. It's like finding breakfast tacos in San Antonio. So if you have one of the few British restaurants in New York City, wouldn't it stand to reason that cream tea would be a mainstay? 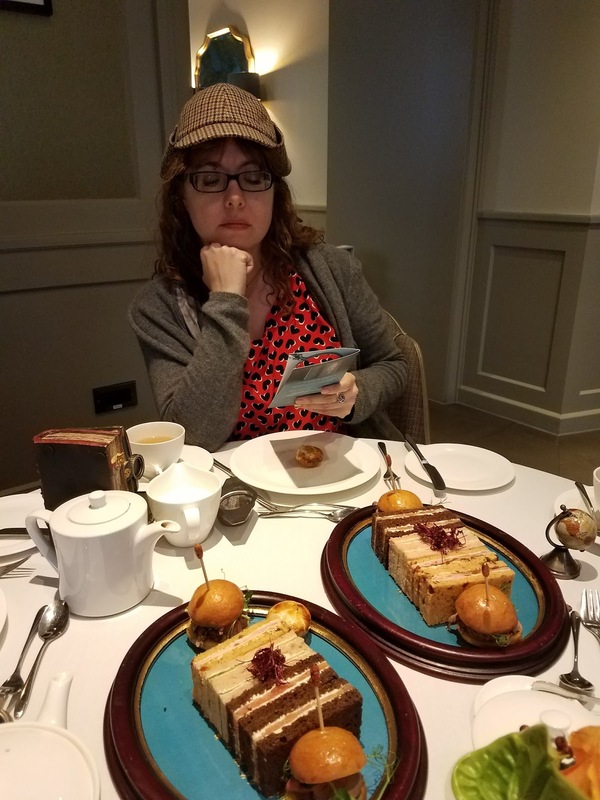 I doubt I will cease visiting which is still one of my favorite places, but I may lessen my visits, and begin a new search for cozy spots that have good tea and scones, or cake or pastries. I enjoy this kind of search, and it's a labor of love with the cooler weather approaching. So maybe they did me a favor by changing their menu. Always look on the bright side! This is a rare year: I've already seen two live Shakespeare performances, and within a month of each other. Both are plays I'm more than familiar with, though they're both not really my favorites. I had a good time each time, though they were pretty different experiences. When you say 'Shakespeare in the Park' to a New Yorker, the first thing that may spring to mind is the post-Memorial Day performances at Delacorte theater, beautifully situated near Belvedere Castle and one of my favorite haunts, the Shakespeare Garden. And it is an evening I recommend 100%, once you're in. There are lotteries and lines to endure before you have that (free) ticket in your hand. I'm grateful that both times I've seen a play here, someone else got a ticket for me. Once you have a seat, which are basic stadium seats in terms of comfort, all you have to worry about is if the weather will hold up. It did for my group! We were there for Othello, which is a Shakespeare play I don't necessarily care for, mainly because it's all tragic misunderstandings. It was well done, though, and I was surprised to see, for both performances I'm speaking of here, that they kept to Shakespearean period costume. Usually the productions dress for a different era, like the 1940s. I'm okay with that, but it's been ages since I've seen a Bard-era costume choice. What made this night fun for me was also the raccoon that stole the show; occasionally these guys find their way to the stage and streak across to thunderous applause. I think they do it on purpose. At one point some ducks flew overhead. You won't forget entirely that you're in Central Park. 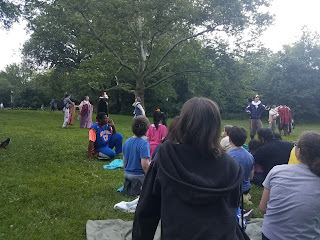 Soon after Othello, I was able to see the other Shakespeare in the park - which was a production of Romeo and Juliet, by the New York Classical Theater. It's sometimes called 'Shakespeare on the Run', because everyone meets up at a designated spot in the park, and then follows the actors for a change of scenery at another spot. It's fun because you can meet up early and have a little picnic (though one you can easily carry is recommendable), and if you're not crazy about your view, it will change in a scene or two. Also, the actors tend to interact with the audience: the 'balcony scene' had Juliet further away and Romeo standing right behind me. As R&J is not my favorite Shakespeare play, I feel it needs to be shaken up a bit to be palatable. There's also the matter of it being a small company, and most of the actors play at least two roles, so the quick changes are pretty fun. The only negative I can see is that getting up and down from a spot on the grass is not as easy for your joints if you're over 25. Like siblings, it's hard to pick a favorite. Both are easy on the wallet - in the NYCT production, you can contribute afterwards, but if your budget is tight, you're still allowed in either way. Be warned that if you're in the mood for a selfie, you'll have to refrain at Delacorte, as staff will FIND YOU. Photography is also frowned on by the NYCT. Just live in the moment! Definitely try at least one of these experiences if you're in New York in the summertime. NYCT moves out to different venues further down the calendar (like Battery Park, which starts in Castle Clinton), but I try for Central Park when possible. And bring the kids! They always seem to have the best time. Just make sure the bathroom needs are attended to prior to the show, and this goes for both productions. I don't always like to talk about personal things here, beyond my occasional cranky mutterings about an overpriced scone. Sometimes, though, I feel like I need to explain something about myself, without worrying about being interrupted. More on that later. So today I'd like to feature the wonderful world of my social anxiety disorder. It's a bit tea-related, as too much caffeine ups the problem, and also taking tea is often a social activity. I have other anxiety-related disorders, but this one screws up my life the most. When I tell people who've known me more than five minutes that I have social anxiety, I'm usually met with an incredulous response. Yes, I've held a job that requires interacting with humans for over a decade. Yes, I do public speaking - I've read my own poems in front of strangers, I have speaking assignments in my congregation, and in a language that I can just about pronounce at that. I sing in front of others at karaoke with minimal shyness. I wear bright colors that could attract attention. Occasionally I've shared writing works-in-progress at workshops and lived to tell the tale. I can't be that badly off if I'm capable of all this? So maybe I don't have the worst case of social anxiety. But it's real, and it's painful, and it has messed up my life. One way is my extreme difficulty in approaching others, particularly to ask for something. This could be a stranger, a co-worker, a family member, even a best friend. I immediately anticipate rejection, and the thought that I may be seen as being a problem. When I'm told "just ask", it's like being told to JUST jump off a cliff. Sure. That's fine. In my college Precalculus class, the final exam was a group project - I chose to do it on my own, and obviously failed the exam and the class because my mathematical abilities are not stellar. But all I had to do was find a group and approach them. They wouldn't mind, would they? Then I had a flashback of being picked to be in a team in gym class during junior high school, hearing the entire group of girls exclaim "No!!!" as I went to join them, and that was that. I've imprinted that moment in my life and stuck it onto another crucial moment, and that feeling never faded away. Now if I need a ride, a travel companion, the bill at a restaurant, I freeze up and just hope someone offers. On a good day, I can text someone with a request. IF I've asked you for something recently, know that this was a big day for me. If you said no, I've probably been set back and won't do it again. And now I've made you feel guilty, and I'm angry at myself for doing that. I've also lived through it, though, so maybe you've helped me after all. Even more difficult than physically approaching someone is calling them. Phone anxiety is pretty common nowadays, but knowing I'm not alone in this does not make it easier. Since I was a kid I hated making phone calls, and leaving voicemails is only marginally better. Making appointments is a nightmare for me: for years I kept going to a hair salon that I was not crazy about because I could make appointments online. Even now I'd prefer going into the salon to make the appointment rather than phoning them. (If a friend offers to make the calls for me, I feel ridiculous.) Receiving calls is just as bad. I keep my phone on silent or vibrate, and often feel a cold sweat come upon me, even if it's a familiar number. Websites like Seamless have been a miracle for me - I get to order takeout with almost no human interaction? Wonderful! - unless the restaurant has run out of my order, and phones me to ask for alternatives. The horror! But wait? Don't I work at a place where I have to call people, and take calls, and cover reception? Yes. There's more than one reason I feel sick every morning. Sometimes I end up shooting the breeze and feeling that maybe it's not such a bad thing, and other times I stammer and say 'like' every other word, and am in tears by the end of the call (or close, because I'm also terrified of crying in public, so I get a splitting headache.) I type at a quick pace, but if someone stands over me while I type I become Typo Woman. When I was a travel agent (back in the early days of internet booking), I would bristle if a client tried to look a the screen I was working on to find a good rate. That was definitely not an ideal job for me. 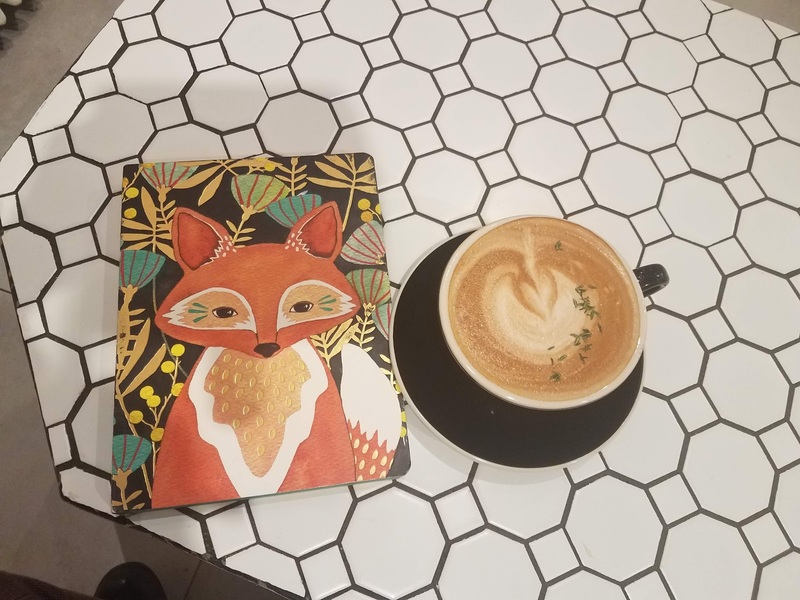 Ideally I should be working in a more quiet position, like data entry, or writer/reader, or with animals (because I will talk to your dog more readily than yourself), but I also need to support myself as an adult, so I power on and make myself sick. Then - oh no! - I have to call in sick. All this is not even going into the horrors of job searching. Life needs to be lived. We are all social creatures. In my opinion, I'm not antisocial (though a bit grumpy). I want companionship like everyone else. I love a good conversation over a cup of tea, or a crazy long walk, or in a bookshop. People are fascinating, and I want to get to know (some) people. I didn't choose to be single. Unfortunately, we live in a world where a lot of interaction and getting to know someone requires being in a crowd. Movies and plays aren't too bad, because most theaters have decent sized seats, and I'm in a dark room where I can't see others (forget opening night in the MCU universe, though). Concerts are less possible for me as years go by, especially general admission. Hanging out in big groups, or any crowded, loud event is something I avoid if I can. It's not always possible. The worst situation is being called out on my discomfort. If I go to a party and want to dance, I will. I'm not a good dancer, but I'll get to the dance floor, and I tend to feel secure in the fact that nobody's really watching me - that is the one safety of a crowd. But if someone calls to me to join the dance, and brings attention to the fact that I'm sitting, I'm done. I'm also highly sensitive, so I can't bear being squashed next to others with little movement, hearing their loud chewing noises and picking up their breath with my nearly supernatural sense of smell. I don't know if that is a part of social anxiety, but it ain't helping. When someone calls someone 'sensitive', it's usually a judgment, and social anxiety sufferers are afraid of being judged. Yay. Only large groups? Well, this can also happen with a few people, but another problem is that I'm also soft-spoken. Like I said before, though, I like conversations, but I don't like to not be heard when I'm speaking. If I'm interrupted, I lose focus and check out mentally. But even if was able to be heard, you can be sure that later on I'll be mulling over everything I said, editing and recoiling in horror about some turn of phrase or personal revelation. 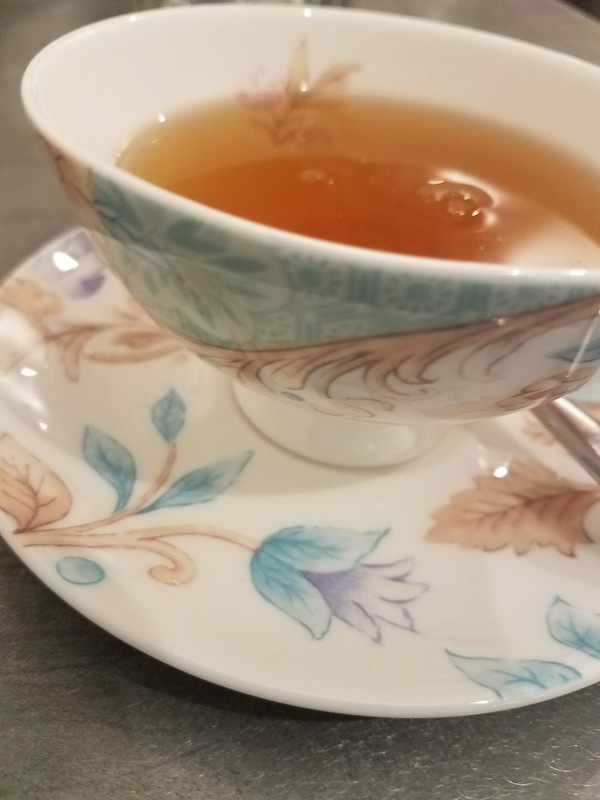 When I first became obsessed with tea, I did what I always do: read, read, read until I know as much as I can about a subject without having a degree. In the early days my reading was almost entirely from books, and mostly books I could either find at my local library or easy to reach branches, with the occasional foray into Barnes and Noble or a used bookshop. Finding tea itself took similar methods. Ordering from a catalog was a rare exception. Nowadays I've learned so much from reading online, and am able to readily purchase from all over the world. To be honest, though, much of what I learn nowadays only reinforces what I knew before - though certain pronunciations and exact methods of preparation make more sense via video tutorials. In the "I liked this before it was cool"beast lurking inside of my psyche, I've known the basics of matcha preparation since reading about it from a green tea book I found in the Central Library in Jamaica, Queens, but in this particular decade you can find a matcha expert, or a burgeoning one, within sneezing distance. What about Oolong? Not as much, not yet. Sure, Twinings has carried its own bags of Oolong in grocery stores for ages, and Chinese restaurants often serve it (though I'm not finding as many of the old-school New York Chinese restaurants around), and occasionally I'll get a flavoured Oolong online but I don't know as much about it as I'd like to, and didn't pay much attention to its preparation. At one point I bought a tea set designed for its particular type of prep and serving, but rarely used it. 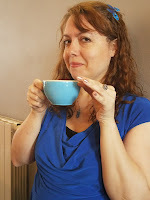 What I suppose I'm saying is that, though I consider myself well-versed on tea, I'm not keeping up as much as I used to. At work I tend to buy a breakfast blend, and maybe an Earl Grey or flavoured green, all in teabags. 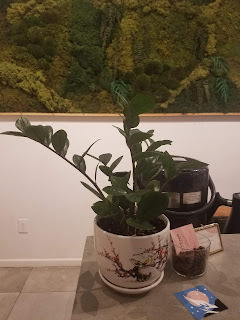 I tried the loose tea method, but it took too long, and I ended up bringing its paraphernalia home. One recent winter's day I found out that, due to moving semantics, my work was going to close at noon for the day. Usually in such circumstances I head to Central Park, or the Met Museum, but occasionally I hit the Village, and I thought 'why not'? I'd read online about a newish place called Te Company, and as I haven't tried any new places recently (except in my own neighborhood, which hopefully I'll get to in another post, for goodness' sake), I went to the West Village for a stroll. I needed to eat, so first I had lunch at Tea and Sympathy (because why not), and then had a browse at Three Lives & Company bookshop (highly recommend), and that was only down the block from Te Company. 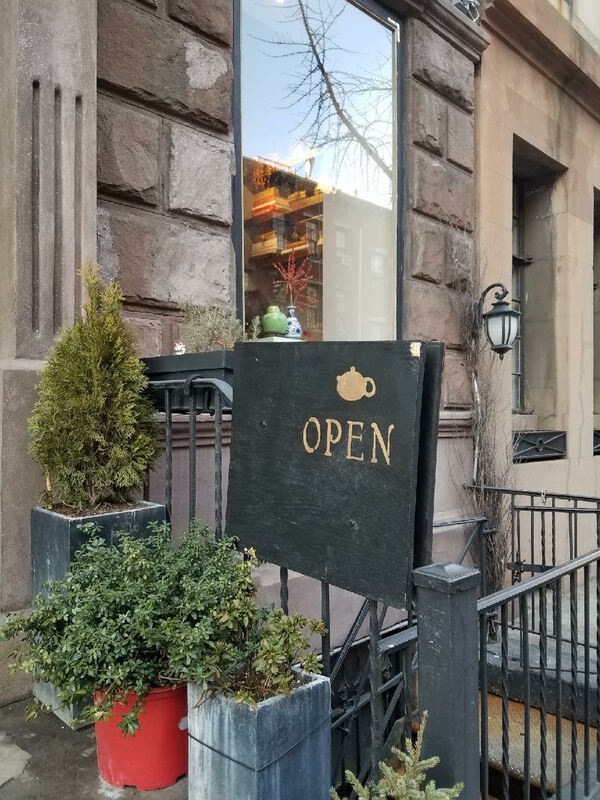 I immediately took to the location, as it wasn't in a typical storefront, but it felt as if I was welcome in someone's clean, tea-filled townhouse apartment. I arrived during a quiet period, which put me in a good mood right away. It started to fill up gradually, but in such a way that did not disturb my highly-caffeinated (for me) self. 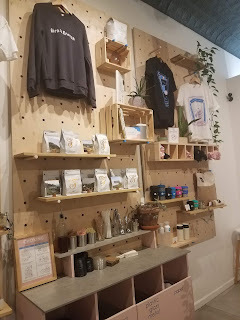 A brief detour into my crankiness: sometimes I become irritated when staff tries to "educate" me on their product, especially if it's something I know a bit about, but in this case the lady who helped me was understated but immensely helpful. And not at all smug. That's important. There's a WAY to make proper Oolong tea, and it means the right water temperature and steeping time (and quality of water, if attainable). The tea is steeped in a warmed tiny teapot, and then transferred to a pitcher, from whence you can pour into the tiny teacup (my hands feel sizable using these cups), et voila! Full flavour of love! I strongly advise everyone to dispense with sweeteners in this kind of situation - I don't remember being offered any, and even if I were, I wouldn't hear of it. This isn't your workaday cuppa, it's the Full Experience. You wouldn't add sugar to a glass of wine, would you? WOULD YOU? You animal! I had a pineapple linzer cookie, which surprised me with its pepper, but pleasantly so. Now, I picked the least expensive tea I could find, as it was not budget-friendly, but I did not sacrifice flavour or enjoyment whatsoever. Frankly, this was my gateway back into Tea Appreciation. That sounds odd, because I appreciate my morning Yorkshire Gold in my mug (albeit a pretty mug) with a splash of milk at work: it's a good friend that wakes me up gently but firmly. But I'd lost track of the slowdown, breathe, savour part of life. Obviously there's a lot to do in our day-to-day life, but in the wise words of Mr. Bueller, "Life moves pretty fast. If you don't stop and look around once in a while, you could miss it." I don't want to miss the finer moments of life, and only stop when I'm sleeping - and I don't stop, I have crazy action-packed dreams. Ten days in the UK ought to do it. My entire list should be covered. Right? wait, Whittard? I've been to many of their shops, and have the ancient tins to prove it. They're merited at least one visit every trip since 1998. The Covent Garden branch has been well darkened by my eager footsteps over the years. 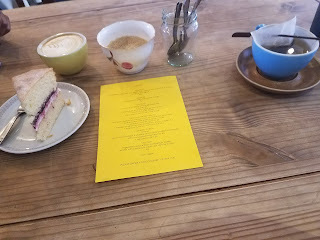 However, said branch only recently opened up a fully-fledged tearoom! Thrilling though this news was to me, I only discovered it on the last full day of my trip, and I had reservations for the Sherlock Holmes afternoon tea to look forward to, so I couldn't just sit there and truly get the experience. I was able to sit and have a cuppa, which as you can see came with little timers in order to brew properly. Usually, I think, they have minimum requirements, but it was Sunday morning, so I guess they were lenient. It was only a taste, though, and now I want more! 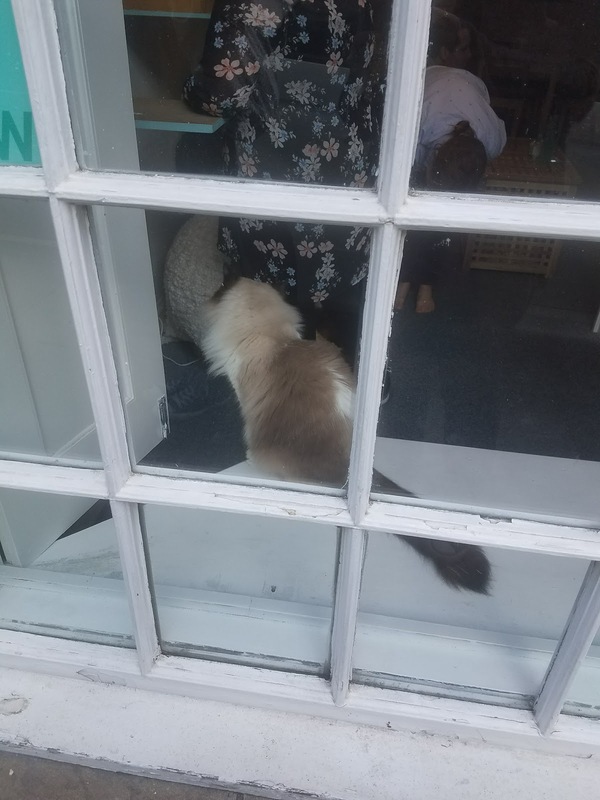 During a crazy long walk on our second day in Edinburgh, we happened to pass Maison de Moggy, which from the outside looked like the cutest cat cafe imaginable. 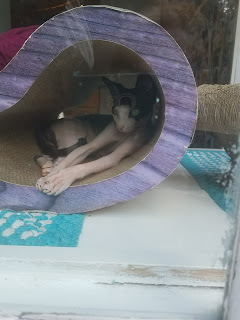 Sure, I've been to Lady Dinah's and Meow Parlour, and would go back to either in a heartbeat, and the Brooklyn Cat Cafe is beckoning, but I believe this is the first place I've seen a hairless cat in a cafe. That's enough motivation for me! I follow them on Instagram now, of course, and now I want to go even more as there's a cat that's looks a lot like my old Duforth. but I still generally ache for the floof. Going to Bon's in Texas affords me her handsome guy, Kombucha. Seeing the eponymous moggies in the window (though moggy tends to refer to non-pedigreed cats, and these guys were all somewhat fancy), was a nice holdover, but a petting session would have set me up well at that point. I also think there would be some pleasing tea and cake inside, albeit laced with cat hair - but I'm used to that! Yes, I am single and over 40. Deal with it. The list continues. I almost made it to Leadenhall Market, but almost doesn't count...we passed the Globe theatre while a play was on, and could hear some of the performance, but I still haven't been in the audience. There are many parks in London and Edinburgh I haven't strolled in, and so many museums in Edinburgh that will have to wait, hopefully not another 23 years. I don't do Afternoon Tea as often as I used to, because if I'm honest it's a bit overwhelming sometimes: too much bread and sweet things for my sensitive system. 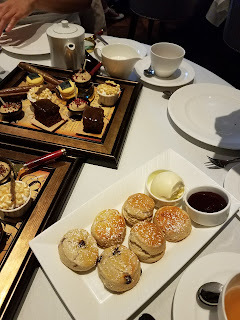 I believe I still have Afternoon Tea more than most people, even more than the average British person, because it's generally considered a Special Occasion. 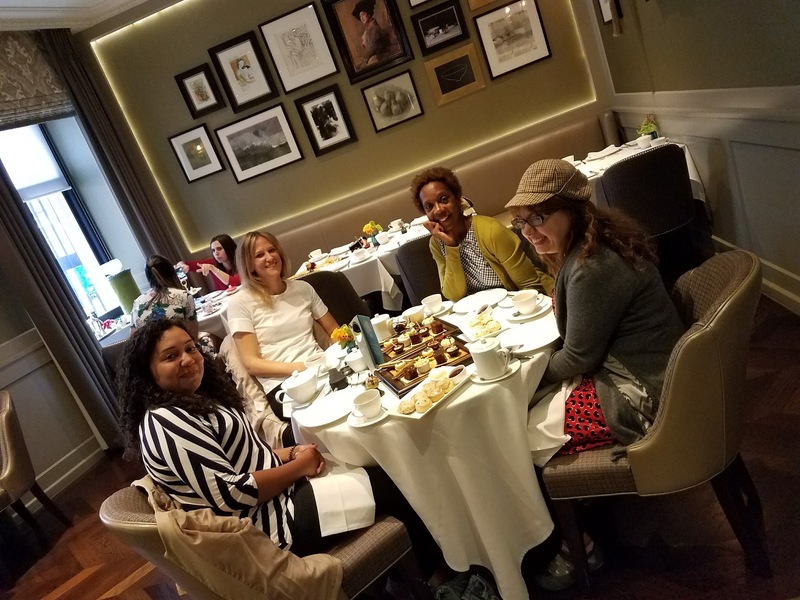 For me, this certainly was special, as it was not only my last full day in London, but also my first Afternoon Tea with Abigail and Clarissa. I'll get my one and only complaint out of the way, and it's not aimed particularly at this particular place, but at AT's in general. There's a surfeit of sweet, and only just enough savory on offer. I'm looking at you, Hound of Baskerville: roast beef to die for, little chicken pies, but just a taste and it's over! If that's my worst complaint, though, I think we're doing well. Scones are vital in an afternoon tea: dare I say, they are elementary? One of the things I especially appreciated about this afternoon/evening is that it reminded me of how much I love good pairings. I've probably gone on about the childhood teatime ritual of having a spot before sitting down to Jeremy Brett's latest performance. 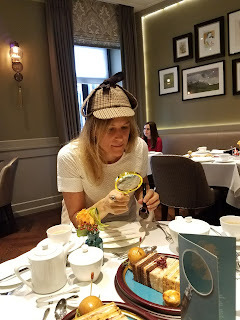 Even though tea is not the first drink one thinks of in connection with Sherlock Holmes, it's definitely part of it, and when you're down the block from the illustrious Buckingham Palace, wearing a silly deerstalker, you can't help but talk about your favorite stories, and then the conversation progresses to other books, and one is complete. There's a part of me that wishes I could find something like this in New York: if I did, I'd try it out, but would it be the same? Emerging fully satiated into the light evening London rain, I don't think it would compare. Lovecrumbs is kind of hipstery, and if you've had more than one conversation with me, you've heard my not-quite-positive views on the whole hipster thing. However, as Bathy is quick to remind me, they do coffee right. They tend to do a good job with tea as well. So I shall forgive the hipster vibe, and the shop-window seating that Bathy coveted but we couldn't snag, and focus on the best thing. Lovecrumbs passed the Victoria Sponge test with flying colors. 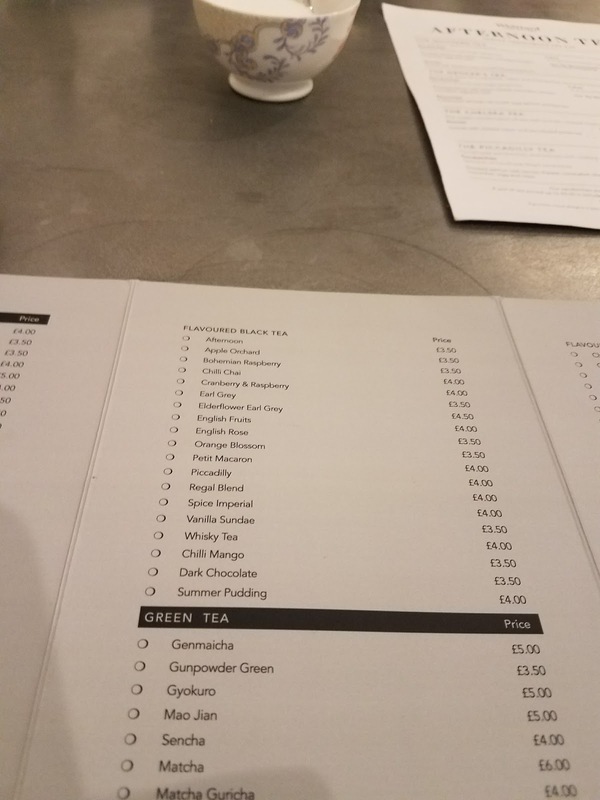 In fact, on our second visit, I tried an orange variation thereof and was smitten. In subsequent perusal of reviews (why do I sound like I work at a law firm? ), I found others were effusive in their Cake Praise. On that alone I shall recommend. Bathy loved the coffee, which I think came from a company called Steampunk, but I won't expand on that as I have limited knowledge (still, try the coffee if you'd like!) I had the Violet Petal black tea, which was heavenly, if you like violet flavoring, which I do. They give you a thermos of hot water, which may not be as cute as a teapot, but it did what it needed to. 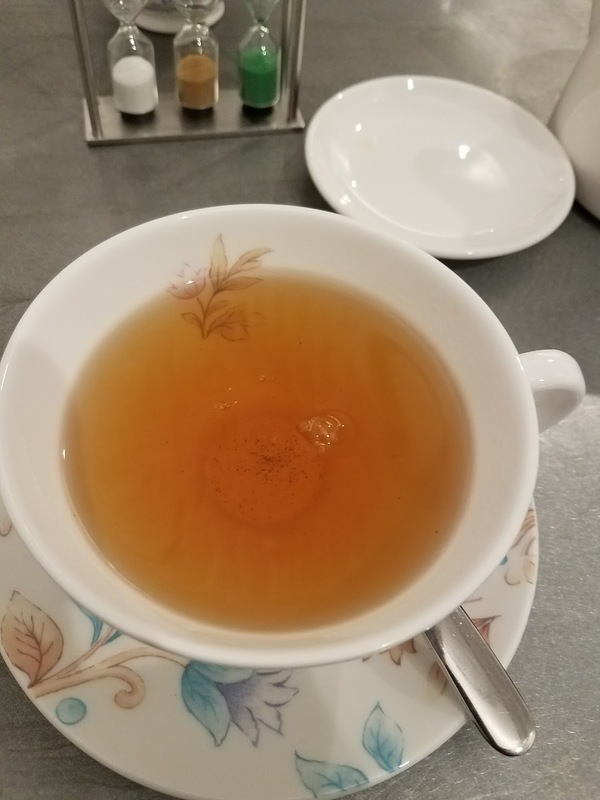 Had a Lemongrass and Marigold tisane the second time, which was nice, but the violet remains my favorite. What I liked about the cafe itself is that it was large and airy, but had cozy places to sit and people watch, read, etc., while having some CAKE! And it has WiFi, which never hurts when you're out of town, or anywhere, frankly. I'll have to do any all-around Edinburgh post, but I thought we'd start with a favorite and work our way in. For now, I'll say it's a good thing Edinburgh is a walking town, as there is much to walk off! 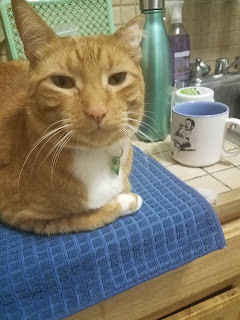 A nice cuppa, all is well.